As always when the Nordic Council meets, someone asks what the Nordic cooperation is good for. This year the Nordic Council came prepared and could present a fresh survey on day one of the session detailing what Nordic citizens think about Nordic cooperation. It turned out that as many as 90 percent of the respondents felt cooperation between the Nordic countries to be important or very important. Security cooperation is considered to be the most important issue, probably partly as a result of the current state of the world. On an individual level, nearly half of the respondents felt the greatest benefit of Nordic cooperation was that citizens could work, study and live anywhere in the Nordic region. Many of the debates during the Nordic Council’s sessions centred on newly launched political initiatives. Nordic MPs highlighted issues like increased Nordic cooperation in the fight against burnout in the workplace and a Nordic equal pay certificate, like the one adopted by Iceland. It is also common for the Nordic Council of Ministers to meets during the Nordic Council’s sessions, for instance in the form of a Nordic prime ministerial summit. Political issues were discussed on a government minister level in Helsinki too. One example is the Nordic programme for cooperation on working life issues, which has been prepared for some years now; in Helsinki the Nordic parliamentarians got the chance to present their final comments to the government ministers. Swedish Social Democrat Pyry Niemi said the Social Democrat group supports the programme for cooperation. He reminded the participants of the many challenges facing Nordic labour markets when it comes to hiring newly arrived workers. “Many who come here find work very quickly; others end up very far from the labour market. So we need to look particularly closely at these issues,” said Niemi. 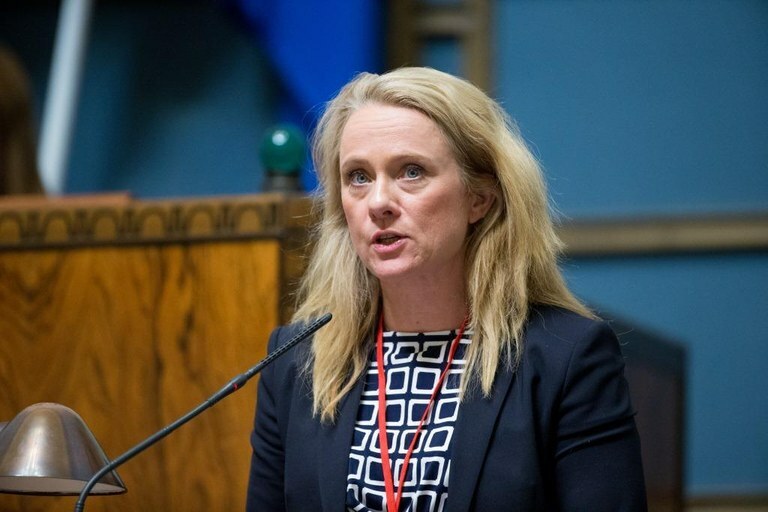 Norway’s Minister of Labour and Social Affairs, Anniken Hauglie, presented the report in the Finnish parliament’s newly renovated chamber. “The programme was very well received in plenum. The background work has been solid, making it easy to take the document forwards,” said Hauglie. Work on the programme for cooperation will be honed during a final meeting of the Council of Ministers in Oslo in mid-November. In the past year the programme for cooperation on working life issues has been anchored among the social partners in the Nordic countries. As usual in political contexts, the programme which has now been adopted is a political compromise. One of the central documents that formed the basis for the programme for cooperation was the Danish Social Democrat Poul Nielson’s report ‘Working life in the Nordic region – Challenges and proposals' from last year. One of Nielson’s most controversial proposals was to introduce mandatory adult education in the Nordic countries. That was not something conservative parties, amongst others, could accept. The Social Democrats agreed to ditch the demand for mandatory adult education, yet they are happy that life-long learning plays a central role in the programme for cooperation – which they consider to be one of the goals with Poul Nielson’s report. “Increasing knowledge levels is one of the most important aims for the Social Democrats in Finland, and also in other Nordic countries,” say Ville Skinnari from the Social Democratic Party of Finland, SDP. The really big issue facing future Nordic and European labour markets is how to handle the gap in competencies which we can already see developing. Which issues are particularly important when it comes to making it easier for foreigners to get access to the labour market? Hauglie holds up Norway’s challenges as an example. Anniken Hauglie underlines that the Nordic labour market is going through comprehensive changes right now, and one of them is digitalisation. Both during the Nordic Council session in Helsinki and in the general social debate, politicians have been warning against parallel societies developing in the Nordic countries, and against the emergence of A and B teams in the labour market. In the next four years the theories outlined in the Nordic programme for cooperation on working life issues will be put into action. What will be the main challenges? In this context, Hauglie brings in the oft repeated term life-long learning. From January 2018, Sweden takes on the mantle as President of the Nordic Council of Ministers. Prime Minister Stefan Löfven presented the Swedish plans for the coming year during the Helsinki session. Sweden says it will host a range of Nordic conferences, including one on how digitalisation and automation effects the labour market, and one on the challenges faced by foreign-born women trying to access the Nordic labour market.